Escarpment's aim is simple, to continually produce the very best of tomorrow's definitive New World wines. Complexity, texture and structure are key words and motivators. Under Larry McKenna's leadership the team aims to reward wine lovers with progressive and suggestive wines that encourage them to venture to the edge of wine loving and appreciation. 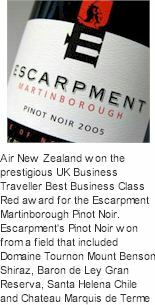 Escarpment Vineyard was established in 1999 as a joint business venture between Robert & Mem Kirby (of Australia's Village Roadshow) and Larry & Sue McKenna. Collectively, these four directors bring to Escarpment a world of experience, skill and understanding to the nurturing and making of fine, deliciously sublime wine. It goes without saying the impetus behind establishing this vineyard came from the four's deep love for Pinot Noir. Meeting by chance in 1999 through Dr Richard Smith, Larry and Robert quickly hit it off and realised they had more than a love for the grape in common. 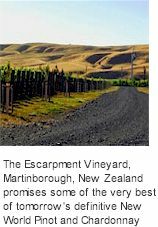 Serious talk about establishing a definitive New World vineyard began in earnest even then and the idea whose time has come has resulted in one of the most significant vineyard developments in the New Zealand district of Martinborough. Making the decision to establish their own vineyard was one thing, finding that special piece of land that offered the essential ingredients required for optimal grape growing and wine making was another. Although they considered other wine growing areas in New Zealand, Larry and Sue kept coming back to the Martinborough area. They knew the area intimately having grown grapes there and making wine there for years. They were convinced Martinbrough offered the rich mix of elements they required to grow and make fine New World wine, particularly their pinots. They soon discovered the Te Muna river terraces across the other side of the hill and knew this was it for them! Basically being an extension of Martinborough's famed terrace land, the Te Muna site offered all the right attributes, with land a-plenty for their purposes. Larry and Sue firmly believe the Te Muna valley is the new future of Martinborough. Evidence for this is seen in the range of new vineyards being established in the area, including much talked about Craggy Range, whose planting alone will double the current output of Martinborough. Looking out from this point all he could see was the expansive kilometre-long escarpment dropping sharply down to the river for a further 30m (it is so steep it can only just be walked up and such daring activity is certainly not recommended after sampling the spoils of the vines when visiting – take the long route!). And so the idea for Escarpment was conceived. Standing at this point you are treated to the most spectacular views of the surrounding country and it is here the vineyard buildings will eventually rest, soaking in the inspiring vista from dawn to dusk. Escarpment's varietal selection consists of 70% Pinot Noir, 10% Chardonnay, 10% Pinot Gris, 5% Riesling and 5% Pinot Blanc. While the majority of these grapes are grown on-site, Escarpment also sources grapes from two other local vineyards growers who grow and supply grapes to Escarpment: Station Bush for additional Pinot Gris and Cleland Vineyard for additional Pinot Noir. Escarpment's deep commitment to Pinot Noir is supported by significant plantings of the latest clonal material available on modern rootstocks. Two plant spacings have been utilised to exploit optimal value from the precious soils, while providing significant quality benefits. While these spacings are considered closely planted by New Zealand standards, it is believed greater complexity will be achieved as a result.